Grab your weapons and put on your armor; there are dragons to hunt. Try as they might, players of the upcoming fifth Elder Scrolls title, Skyrim, will never be able to kill all of the game's dragons. That's not because there's one unkillable one tucked away somewhere though, but rather that the game has an unending supply of them. 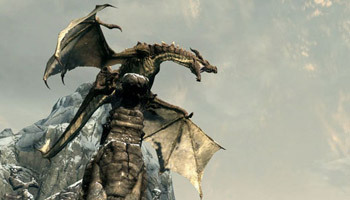 Speaking to Norwegian gaming site, Gamer.No, Bethesda's Todd Howard said that as well as a number of scripted encounters with fire-breathing, flying reptiles, Skyrim would also contain an unlimited number of random dragons that players could find and fight, making dragon hunting a profitable and sustainable career. Not every dragon would be just beasts to kill however, Howard explained, and some would actually be able to talk to the player, although he couldn't go into too much detail on that point just yet. There was even some talk of being able to ride a dragon, which Howard said that it wasn't currently a feature in the game, but that the situation could change in the future. Howard also explained why it had taken so long for dragons to appear in an Elder Scrolls game. He said that dragons had become something of a clichÃ© in fantasy games, and it was something that Bethesda had decided not to do them just for the sake of it. He said that the studio had decided that Skyrim was the right game, and the right setting, for dragons to make their Elder Scrolls debut, but that it wanted to handle them like a Jurassic Park game might handle dinosaurs.